It’s hard to believe that the Tomb Raider franchise has been in existance since 1996 when the first Tomb Raider game made its debut on the Sony PlayStation. Well, much has changed since then. Tomb Raider: Underworld is the latest game in the series brought to us by Eidos and Crystal Dynamics (same team that also worked on Legend and Anniversary). The story for Underworld centers on Norse mythology and specifically Thor’s Hammer. Lara sets out to find Thor’s Hammer as she believes her search for this relic will also shed light on the mystery of her late mother’s death. The game’s opening level is a prologue sequence where Croft Mansion has been nearly destroyed and you need to guide Lara safely out (actually, you’ll replay this sequence again about half way through the game). As soon as you complete this level, the game flashes back a week and this is where the story begins. If you’ve played Tomb Raider: Legend, then you’ll immediately familiarize yourself with Underworld. The control scheme remains the same with the addition of a few new moves in Lara’s arsenal. These include the ability to wall climb, walk along beams and grapple wall run. These added moves provide a new and refreshing way to advance through the games levels. Other new moves come in the form of combat controls. One of the cooler new combat mechanisms is the Adrenaline Headshot. This is a one shot kill that can be activated when Lara’s adrenaline meter is full. Another change is the replacement of the interactive cut scenes (ones where you are prompted to press a certain button on your controller to successfully complete the scene) with slow motion sequences where you have a short amount of time to initiate the correct move for Lara and safely complete the sequence. 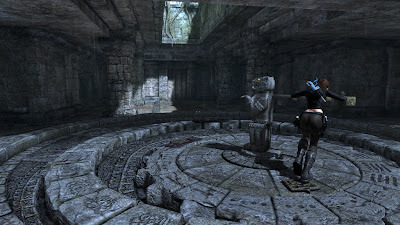 The game’s environments and level design are trademark Tomb Raider. They are large in scale, beautifully detailed, explorative and well thought out. They also present a wide variety of flavours. You’ll go under water, underground, inside Croft mansion, on a shipping vessel, etc. Locals include Thailand, Mexico, the Arctic, the Mediterranean Sea and more. Where Underworld really shines is in the puzzles. All of them are well designed and offer a decent challenge to complete them. They also take full advantage of the large level designs as you’ll find a thorough exploration is required to successfully complete the main task at hand. When it comes to combat, Underworld has been toned down quite a bit compared to previous Tomb Raider games. There are far less foes that you go up against and the ones you do encounter don’t present much of an effort to eliminate. There are no actual boss fights either. In the end, the emphasis is placed on puzzle solving and exploration with some gunplay thrown in between. Amongst all of the good things that Tomb Raider: Underworld does well, there are still some mildly frustrating issues that have carried over from previous versions of the game. These include the regular instances of odd camera angles and positioning. A prime example is when you’re scaling or climbing a wall and you need to leap to an object behind you, but the camera doesn’t swing around far enough to allow you to see where you’re target is. There are also regular glitches where Lara will get ‘stuck’ to various objects within the environment and you’ll need to either fire your weapon or frantically jump until she becomes free. All in all, Tomb Raider: Underworld is an enjoyable and satisfying game. If you are a fan of the series, then you will not be disappointed with this game and you already will have learned to deal with some of the game’s minor issues. If this is your first encounter with a Tomb Raider game, then you’ll definitely appreciate the puzzle design and the ability to explore and experience some visually stunning and interactive world environments. I'm still disappointed they don't offer a co-op mode all the way through. Exclusive Downloadable Content – Friend or Foe? What Console Do You Play The Most? Guess What Our Hottest Posts of 2008 Were?